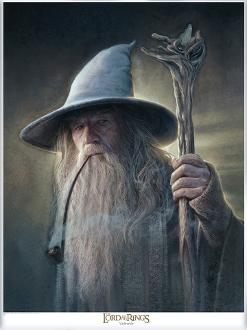 This fine art giclee features a depiction of Gandalf the Grey from the Fellowship of the Ring film. The PAPER GICLEE utilzes Fine Art archival paper. Comes signed and numbered by the artist with Certificate of Authenticity.This Fine Art Paper Giclee measures 18 x 24 inches. Paper Editions are limited to 500 pieces worldwide. The CANVAS GICLEE utilzes Breathing Color's archival "Lyve" canvas, complete with hand-applied protective varnish. Comes signed and numbered by the artist with Certificate of Authenticity. The canvas measures 20x27 inches faceing art. Limited to 250 pieces worldwide. If you choice the gallery wrapped option, please allow 2-3 week for completion.